I was thrilled with the look and style of my graphics but some of the edges started to peel back after the first time I washed my bike. I picked up a new (to me) bike and needed to freshen it up with my race number. The left shroud graphic came incorrectly cut for the bike. RMATV did send out a corrected shroud graphic, but I had already cut new holes in the old graphic to make it work. So, that will stay on there for now. Then, I went out to the track once... and the graphics are not holding up well. Even with a heat gun some of the sharper turns/angles were not holding down well. The graphics around the airbox have thin lines of graphic which quickly moved around. Finally, the right rear number plate graphic was almost trash from my boot rubbing on it for just that one ride. 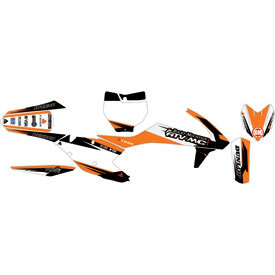 I will go back to PanicREV/Split Graphics as that is what I had on my previous bike and they seemed to hold up much better for 15+ hrs of riding. Is the “worcs” blue Yamaha blue? BEST ANSWER: Yamaha blue is listed as YZ blue. The Worcs blue is lighter and the actually racing colors. No. It seems to be a factory ktm blue which is a few shades brighter. I do like it though. I was getting tired of orange...they look good. Do you print numbers on the decals? BEST ANSWER: We will print the numbers on the number plates decals. If you enter in your machine and select a color it will allow you to customize them. Can you put logos of your choice on it? BEST ANSWER: Unfortunately, there is not an option online. However, if you email attackgrapchics@rockymountainatv.com with the logos you would like to add on to your graphics they will be able to let you know if they can add them or not. Please note this may extend the processing time. Is there anyway to customized the attack graphics without all the Rocky Mtn logos on the stickers? BEST ANSWER: Unfortunately, we are unable to remove the Rocky Mountain logos. However, we do have some Number plate backgrounds that don't have the RM logos on it.